Digital games platforms have never been that many than nowadays. Compared to personal mobile or virtual reality headsets, the arcade cabinets appear to be video games dinosaurs. However their legacy is still very present and living through modern devices and digital interfaces. 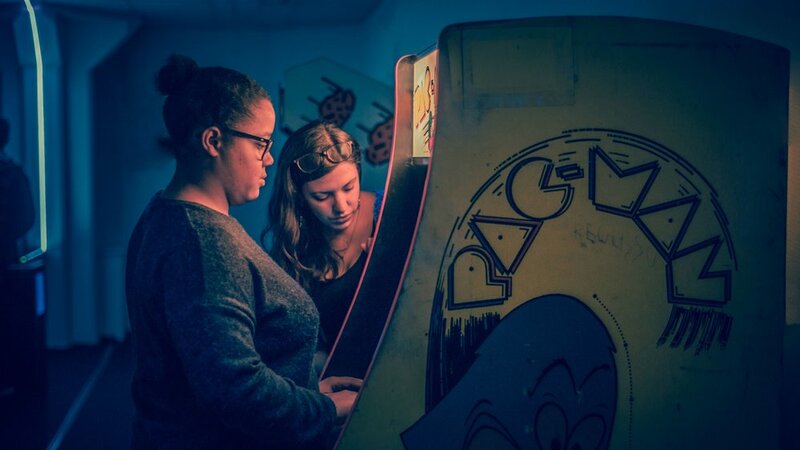 Artists and independent game developers have been experimenting around alternative controllers these past years and the reappropriation of the arcade cabinet as a way to produce modern experiences but also a different way to showcase and exhibit their works in public spaces. The arcade as a unique venue to gather a diverse audience and a genre of devices to perform digital games is the main topic of this exhibition. Designed and co-curated with Nicolas Rosette, Welcome to the Arcade is a pilot exhibition of a broader project that aims to question the influence of the Arcade among the contemporary indie game & digital art scenes. Gathering classical arcade cabinets from the 80's such as an original Pac-Man with unique artwork from independent game creator & artists such as Babycastles, Klondike or Devillé Arcade was a way to initiate a 'playable' dialog between their influences and what they embody as a platform to perform digital games in public.